A fresh spacecraft was launched into orbit for the U.S. Air Force's Global Positioning System on Wednesday to fill a void created by the recent loss of the constellation's inaugural satellite. Boeing's Delta 2 rocket pierced the nighttime Florida sky at Cape Canaveral and successfully carried the GPS 2R-4 satellite aloft during a 25-minute flight. Liftoff occurred right on schedule at 9:48 p.m. EDT (0148 GMT Thursday). No problems were reported with the Delta rocket, and the third stage released the satellite into the planned elliptical orbit around Earth while flying high above the South Atlantic half-way between South America and Africa. 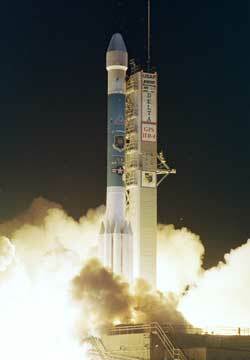 The safe journey marked the 31st time a Delta 2 had carried a GPS satellite into space since 1989. U.S. Air Force satellite controllers at the 1st Space Operations Squadron of Schriever Air Force Base in Colorado established communications with GPS 2R-4 through a tracking station at 10:26 p.m. EDT, confirming its health following the roaring launch. Over the coming 17 days, the craft will fire its onboard kick engine to reach the GPS constellation cruising in a circular orbit 11,000 miles up. The power-generating solar arrays are slated to be deployed four days after launch. Following the initial time in space, control of the satellite will be handed to Schriever's 2nd Space Operations Squadron, which will test the craft's navigation payload and fly the craft for the rest of its planned 10-year life. The $42 million GPS 2R-4 satellite is expected to enter service in about one month, replacing GPS 2-1 launched in February 1989 in the constellation's E1 slot. That older craft malfunctioned on March 26 after exceeding its expected life by four years, and was decommissioned on April 14. The Air Force's highly successful GPS network features 24 satellites working in concert to provide precision location, speed and timing information to guide U.S. military troops, aircraft, submarines, ships, weapons and civilians around the globe. The two dozen satellites are split into six groups, or orbital planes, with four primary spacecraft in each. Users of GPS rely on handheld receivers that pick up signals from four satellites passing overhead at any given time. The receiver measures the time delay for the signal to reach itself from the satellite, which ultimately shows the distance to the orbiting satellite. Military users can then determine their exact location to within feet, speed within a fraction of a mile per hour and time to within a millionth of a second whether it be on the ground, in the air or at sea. GPS was used extensively in the featureless desert battlefield of the Gulf War. Civilian receivers are also popular for hikers, boaters, pilots and mapmakers. On May 1, U.S. President Bill Clinton announced the intential degrading of GPS signals to weaken accuracy for civilians would be stopped, improving location information tenfold. In his announcement, Clinton said that his goals for GPS were to "encourage acceptance and integration of GPS into peaceful civil, commercial and scientific applications worldwide; and to encourage private sector investment in and the use of U.S. GPS technologies and services." There are currently 27 GPS satellites working today, and GPS 2R-4 will become the 28th. The extra satellites beyond the minimum 24 needed bolster the constellation and serve as orbiting spares. 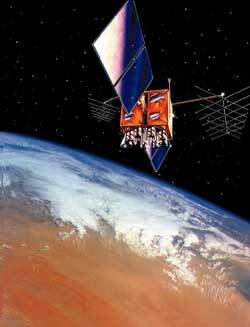 As its name suggests, GPS 2R-4 is the fourth of 21 the advanced series of Block 2R satellites. Manufactured by Lockheed Martin Space Systems, the latest generation of spacecraft were built with improvements over the earlier Block 2 and 2A including the ability to operate longer when out of contact with ground controllers, better accuracy by communicating with other GPS satellites, larger fuel supplies and additional radiation protection. The remaining Block 2R spacecraft will be deployed through 2006 to steadily replace the older satellites as they break down. Wednesday's launch was originally slated for April 21, but was first delayed by a ground equipment problem and then the following night by a last-minute concern with the solar array deployment mechanism used by the GPS satellite. Officials had to wait nearly three weeks before rescheduling the launch because of the other rocket flights and tests at the Cape. The next Delta 2 rocket launch will carrying another GPS satellite into orbit on June 15 from Cape Canaveral. Launch - Images of the Delta 2 rocket from the countdown and launch. The Boeing Delta 2 rocket lifts off on May 10 from pad 17A at Cape Canaveral carrying the GPS 2R-4 satellite for the U.S. Air Force. The Delta 2 rocket's three air-lit solid rocket boosters are ignited and the six ground-start motors are jettisoned. A time-lapsed movie shows the 12-story mobile service tower being rolled away from the Boeing Delta 2 rocket at launch pad 17A on April 21. Animation depicts the GPS satellites and the Global Positioning System orbital constellation. Launch Preview - Our story gives a complete report on the upcoming launch.